Today is the second instalment of our planned “What’s in the box?” activities for advent as we count down to Christmas. Our hopefully very excited toddler will search the house for this sparkly Christmas box each morning which will contain his morning table activity. Previous activities will be available in his “school” cupboard for use while his siblings are working on their Blessing Buddy act of kindness for the day. 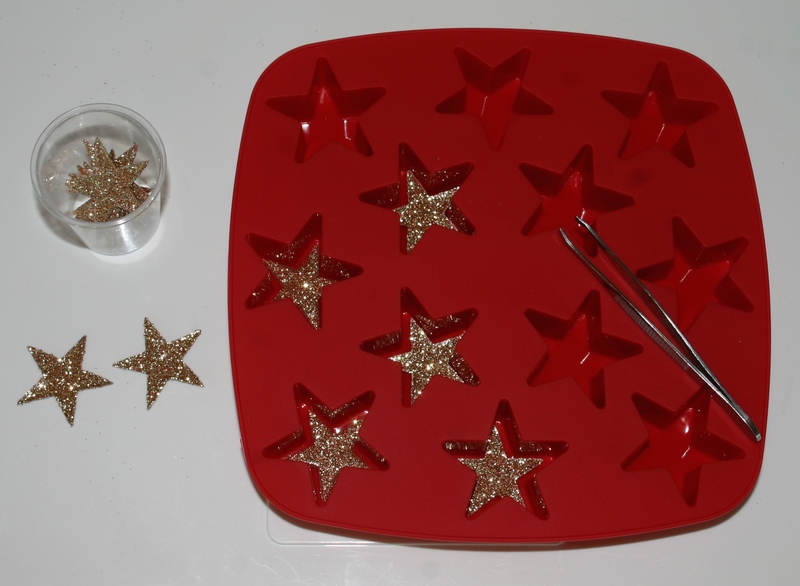 Using tweezers to transfer stars into an ice cube tray will be new to him so I’m not sure whether he has the dexterity for the tweezers or not. The tweezers can be easily swapped with small tongs if need be. Pretend cooking play is always popular, especially if I come over for a taste of Christmas cookies now and then. These large coloured glass stones and oversized marbles are from our local discount variety store. 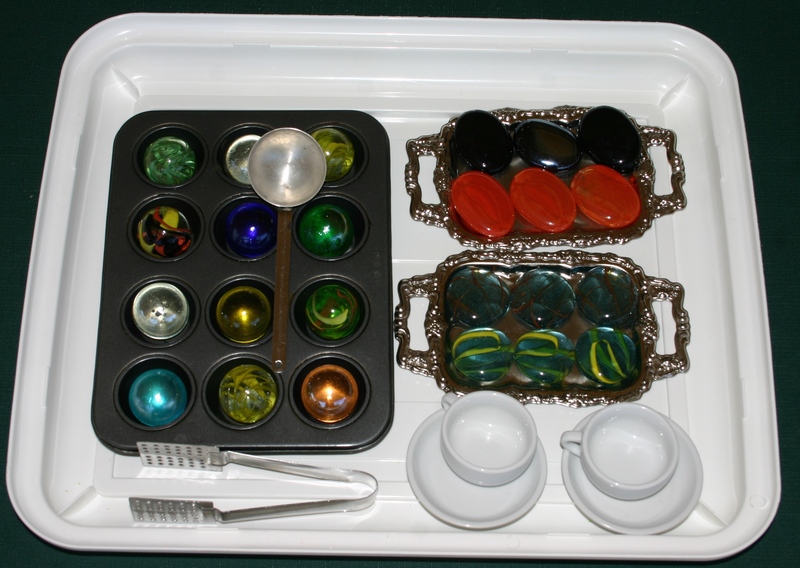 A mini muffin tray and tea bag tongs promote one-to-one correspondence practise and transferring skills. Dotting with bingo markers inside do-a-dot pictures is a semi-controlled way to present a painting experience. I am quite certain however that dotting in the circles will not be satisfying enough and that the final product will be well and truly smeared with paint! (Better cover the tray with newspaper for this one.) 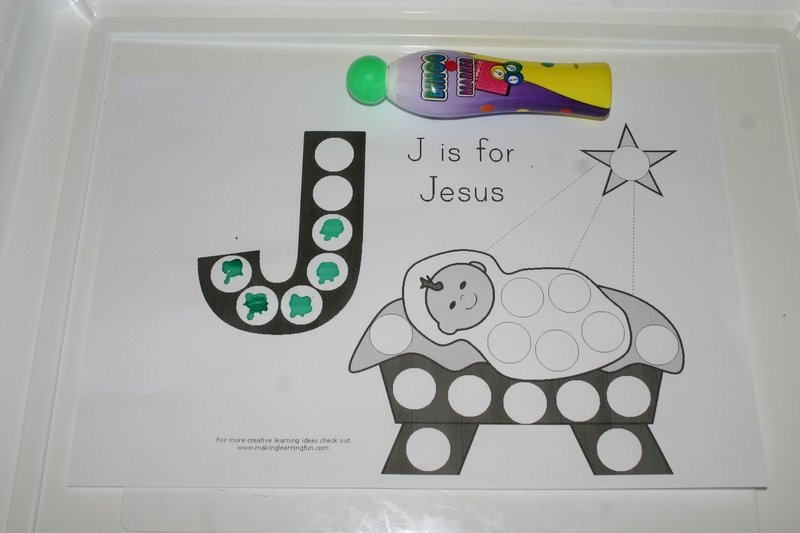 Free printable pictures to dot are here and here or google do-a-dot for hundreds. 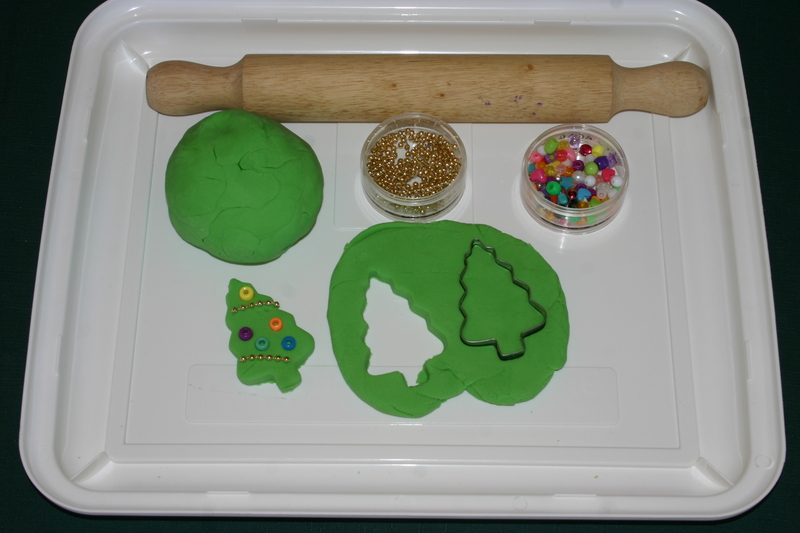 Decorating playdough Christmas trees with beads and tiny bead strings will be fun. Toddlers find it very difficult to roll out dough though and may also need assistance with the cutter. Be prepared to cut a bunch out for them if necessary. This toothpick Christmas tree is great for fine motor skills. 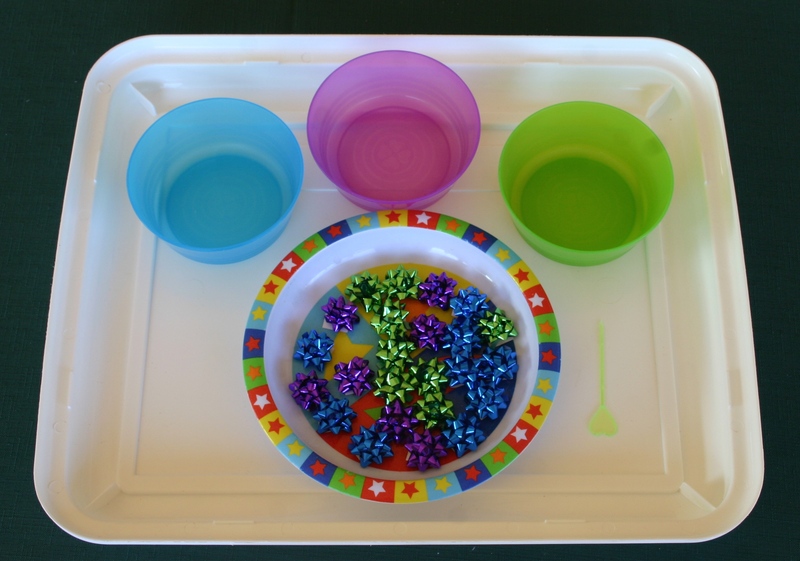 The child pokes toothpicks with coloured ends into holes in the top of the box lid (use a skewer to poke them through.) 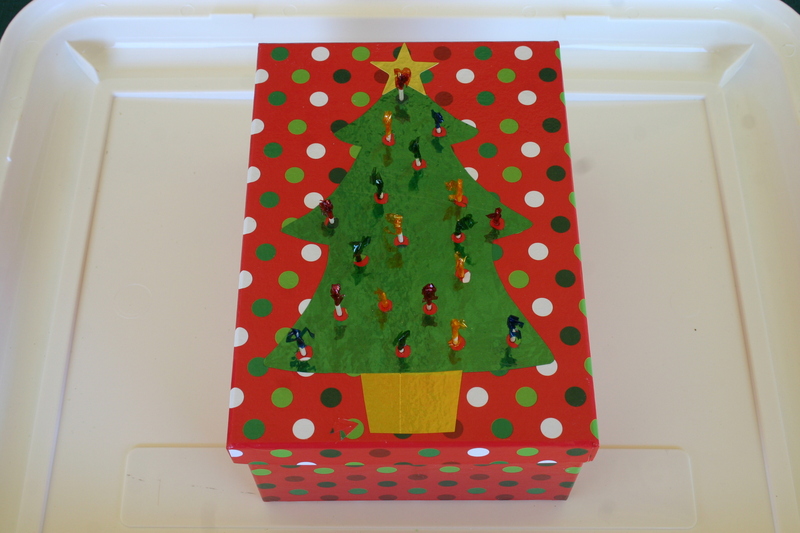 I used coloured contact for the tree and punched holes with a single hole paper punch before sticking it onto the box lid as I know from experience that poking holes through contact on cardboard can be difficult and doesn’t always leave a nice clean hole. How is your Christmas planning going? 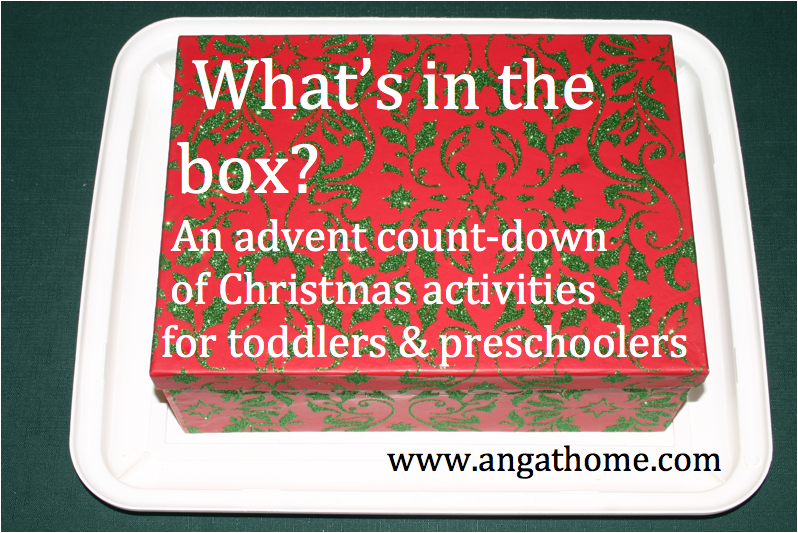 Our “What’s in the Box?” advent count down of Christmas preschool activities is a new tradition for us. While the older children are working on other projects for our Blessing Buddies acts of kindness, our toddler will be opening his special Christmas box to find his table activity for the morning. The sparkly box will be hidden somewhere around the house for him to find each day and will contain a new and exciting challenge for him to work on independently while I help with the older children’s more complicated projects. The first activity needs to be one that is guaranteed to hold his attention for a longer time span as it will be the only one available. As each new activity is introduced, I will place it onto our toddler activity shelves so that I can rotate between them when interest in the new tray for the day has worn off. This Christmas sensory tub will be filled with all the wonderful “Christmas” items in the photo above. (If it’s green it’s Christmassy right?) The items can be sorted, transferred with tongs or cutlery, hidden and found, tipped and poured and generally fiddled about with. 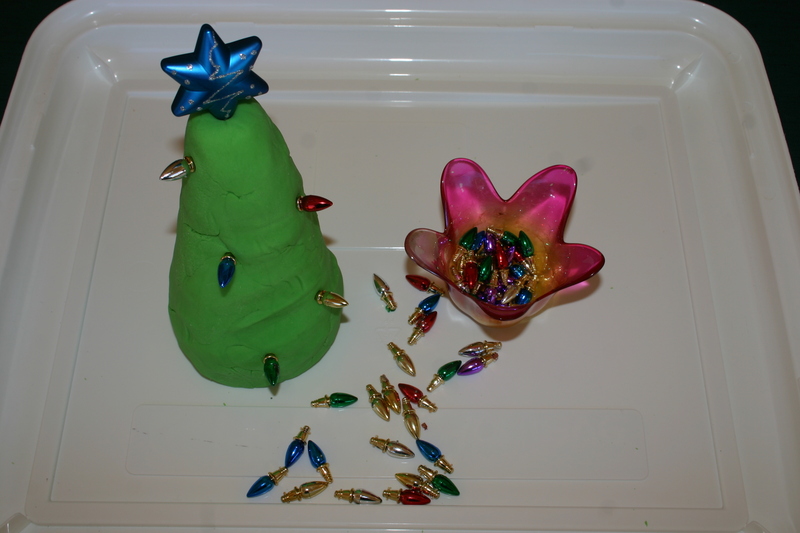 A new batch of green playdough formed into a rough Christmas tree with small lights cut from a plastic Christmas garland to poke into the dough. You could also use beads or any other small decoration. 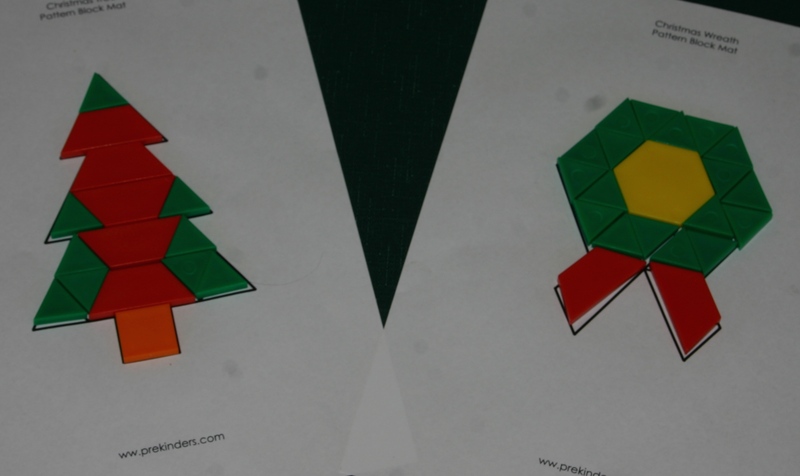 A colour sorting activity with 3 colours of Christmas bows. I have included a toothpick with a large flat end to hold while sliding it into one of the loops of the bows to transfer them into the matching coloured bowls. We’ll see how difficult this is for him – it may be quickly changed to small tongs. Simple pattern block puzzles.These free printable patterns are available here. I intend to laminate these for greater durability. My older children all jumped at the chance to fill these out for the photos and after watching me prep these trays throughout the day, my 11-year-old commented that he almost wished he was a toddler again, just so he could do the activities! 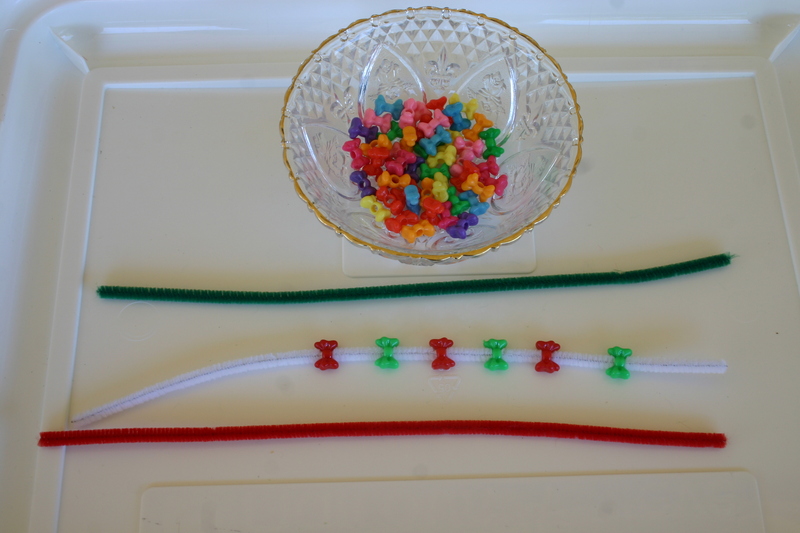 Threading bow-shaped beads onto coloured chenille sticks (pipe cleaners.) Make sure the holes are large enough so that this is not too difficult for little fingers. Older children could make patterns with the colours. Stay tuned for days 6 to 24. What are your toddler’s favourite Christmas activities?